The Vatican: Some called it “disturbing” — while others view it as an act of “demystifying” the papacy — but every member of the royal court of Catholic Twitter seems to have an opinion on the video of Pope Francis expressing visceral annoyance at Catholics seeking to kiss his ring. Others, however, responded that Francis’ actions reflect a man who has garnered a reputation as the pope of the people, seeking to institute a more humble approach to the way in which Catholics engage the papal office. Medieval church history scholar Christopher Bellitto, a professor at Kean University, said the ancient tradition of kissing the pope’s ring is not part of any formal protocol while greeting the pope, but one synonymous with patterns of behaviour for how one would greet kings, queens and emperors. John Allen, a veteran Vatican journalist and editor of the online Catholic news site Crux, concurred, saying Francis’ actions Monday are one further move in a trend that’s continued since Pope John XXIII to “dial down the tradition of subservience,” which has traditionally marked the papacy over the centuries. 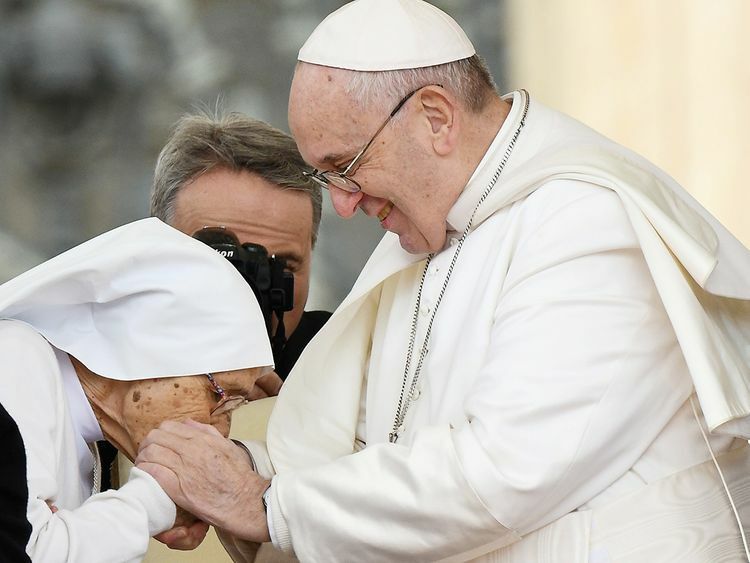 Francis’ reaction, he believes, is one further step to demystify one of the world’s most secretive institutions, and after the Second Vatican Council (1962-1965), popes have made gradual efforts to bring the office into the modern era. In 1964, Pope Paul VI sent shock waves around Rome when he shipped off his bejewelled papal tiara for a charity tour around the United States to benefit Catholic Relief Services, making him the last pontiff to don the crown. Pope John Paul I’s brief 33-day papacy changed the course of papal liturgy when he eschewed the papal coronation ceremony for a Mass of inauguration. Pope John Paul II, who would jet around the world visiting 129 countries, abandoned the portable papal throne for the popemobile, allowing easier access to the masses that had come out to greet him. For Allen, the lesson from Monday is that the Vatican’s master of ceremonies for papal events should reconsider how it communicates with those attending a papal audience and explain to them that Francis would prefer for his guests not to kiss the papal ring.